If you haven't seen The Last Jedi, do that. Or maybe don't, if you don't want to. But there's a lot of spoilers here, so consider yourself warned. I love Star Wars. Like, a lot. I've read over 50 of the old EU novels, watched just about everything that has the Star Wars name, I've pretty much memorized A New Hope, and you know what, I'm a big enough fan that I even kind of like The Phantom Menace, despite its flaws—and they are many—because, Star Wars, man. But the more I think about The Last Jedi, less excited I get. During The Last Jedi, I had a great time. I thought it was really fun, funny, had some really great moments, and some really terrible ones (how did Leia force-flying in space make it through brainstorming meetings? Ugh.) After I left the theater, I was jazzed. It felt great. But, this movie has had an odd effect on me: I can't stop thinking about it, and the more I do, the less I like it. I've read a lot of great reviews and a lot of poor reviews and talked to a lot of people and I finally have some thoughts. One Twitter user (sorry, can't remember who or I'd give credit) summed it up really well: "TLJ was a good movie, just not a good Star Wars movie." And I agree completely. Why wasn't it a good Star Wars movie? 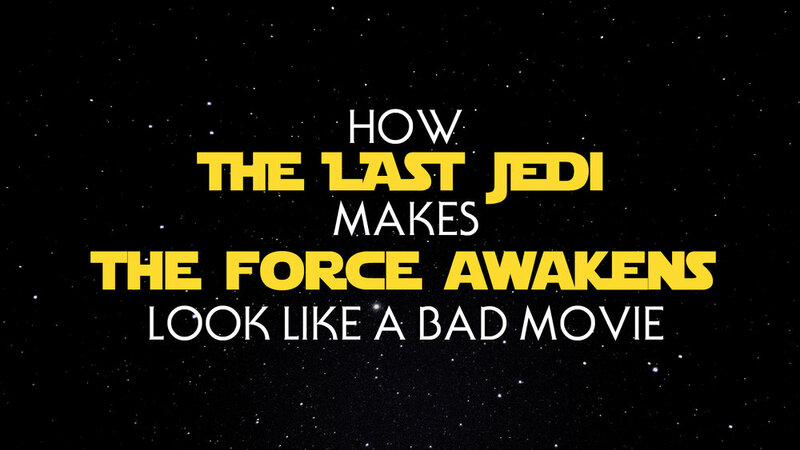 Because it broke Star Wars. Here's the thing, I can't get on board with the critics who are lauding Rian Johnson for his bravery and wit and breaking the mold of Star Wars. Before you rush to tell me things need to change and we need new, fresh takes on the SW universe, let me tell you that I agree. I've read a ton of EU novels, and my favorites are the ones that have nothing to do Han, Luke, or Leia. In fact, I'm honestly really excited about the new Star Wars trilogy from Rian Johnson. I really am. But you know when a great time to break the mold is? With a new story. Not in the middle of the story. One of TLJ's problems, in my opinion, is that it started out way too plucky comedy. It was hilarious, to a fault. It was the longest runtime of any SW movie, and that maybe could have been trimmed by eliminating the excessive comedy. Honestly, it was as if Peter Jackson had decided the middle act of Return of the King should be written and directed by Mel Brooks. Yes, I am saying that TLJ is the Monty Python of Star Wars movies. I want them to take risks. I want them to challenge what we think about Star Wars films, but can we please finish this story first? All in all, I do think this movie will be remembered generally fondly. I think once the 9-movie Star Wars saga closes, this movie will finish in the top 50% of films. But, I think this will happen at the expense of The Force Awakens. J.J. Abrams is in charge of Episode 9, and I have no doubt that he will continue the story Rian has set forth and will wrap it up in a good place. This will make The Force Awakens look like the odd-movie-out of the saga. Which stinks, because I liked that one. I want it to be the movie that reinvigorated the series, not the one that doesn't make sense in context, but Rian Johnson has made sure that TFA will be just that: out of place. Let's break it down. The first new major character we meet is Poe, and he's awesome. Witty, quick, smart, and a crack pilot, what's not to love? We don't see much character growth in 7, but we don't need to, because Poe is awesome. We want to see more Poe. We want to see him do awesome things. Enter TLJ: Poe is an insubordinate blockhead whose actions directly caused thousands of deaths. Thousands. I can't root for that guy. I can't even, in good conscience, like that guy. The entire Resistance storyline in this movie is a plot device for Poe's character to grow in some way, but he never really arrives where he should in any meaningful way because even though he's kind of insubordinate, he's doing good things too or whatever. I'm not sure, I really lost track of what I was supposed to think. He was set up in TFA to be a more meaningful Wedge Antilles for this trilogy, but by the end of TLJ, I completely stopped caring about him. Finn has the exact same story arc as TFA. Literally, they copied and pasted his character's narrative. The only thing Rian Johnson didn't copy was putting him in a coma at the end of the movie. Do something interesting with this character. Obviously, Snoke was set up as the big bad for this trilogy. New guy is pretty evil, ominous, mysterious, powerful... I dig it. I can like this antagonist. Enter Rian: "Nah, I think we'll give him a really unceremonious death and forget he ever existed." Oh, okay. So now the screen time he gets in The Force Awakens is completely ruined for me. Neat. I didn't have many opinions about Hux in TFA, actually. He's kind of the face of the New Order, cool. Gets to do the speeches and stuff, leads the army, seems confident, can tame Kylo. I'm on board, I guess. I like the tension between Kylo Ren and him, could lead to something interesting. Except in TLJ, he's a bumbling idiot. Really has no relevence whatsoever, besides as comic relief. He's Guy from Galaxy quest. Why? From his opening moment, we're told that he isn't going to be what we expect, and that's fine, I can buy that. I'm good with seeing a grumpy old Luke who has to find a reason to go on. But they just went too far. He was almost Kylo Ren in TFA: whiny, irresponsible, almost unlikeable. And of course, he becomes one with the Force at the end. So now, there's like a quarter of a Skywalker as the only living Skywalker in the last movie of the Skywalker Saga. And, half the Star Wars fanbase doesn't even care about him. It's like, if the last half of Return of the King killed off Aragorn and let some random cousin of his try and take on Sauron. Nothing makes sense. Had like 2 minutes of screen time. Had like—actually, I'm fine with him only having like 2 minutes of screen time. Weren't we supposed to get more Captain Phasma? Wasn't TLJ supposed to make up for the lack of screen time for this character in E7? Why do Star Wars movies always kill of interesting villains?! Seriously, J.J. had a good thing going with her. She's like the Boba Fett of this trilogy. Even Fett got 3 movies out of it. Why? I'm actually pleased with this character's growth. I like where he's going. He's acknowledged the fact that nobody likes a whiny teenager, and we're actually trying to make him a cool, meaningful villain. I'm on board. Good work, Rian, I approve here. A major indictment of TFA was that it was essentially a clone of A New Hope, and in nearly every way, it was. It's true. But, you could do worse than cloning A New Hope. J.J. may have borrowed some (okay, a lot) from A New Hope, but he was setting up something meaningful. A launch pad for a new trilogy that will bring some closure (not that we needed it) to the Skywalker Saga. But, Rian Johnson saw all of his points and threw them in the salts of Crait. This isn't bravery: it's selfishness. Desperate to leave a mark on one of the greatest cinematic narratives, Rian took risks and broke the molds of what we expect from Star Wars, but did it in a way that will only make its predecessor more difficult to watch. As J.J. Abrams creates the finale to this 9 movie saga, he will be wrapping up a storyline that was decimated and reassembled in 153 minutes. And he'll do it, and it will probably be great, but in the end, The Force Awakens will look like the bumbling idiot that doesn't fit with the narrative of the other two movies. Now, I can't watch The Force Awakens without knowing Finn doesn't change. Snoke doesn't matter, Luke isn't really the hero we needed, and the Jedi don't matter. Captain Phasma is just a shiny suit, and General Hux somehow got to be a general, even though he might be better suited on the set of another 3 Stooges reboot. Subsequent watches of TFA are a waste of my time, because that movie doesn't fit in this new narrative. I want to see new and exciting things. I want to see untold stories and places from the galaxy far, far away. I want to be excited about what's on the horizon, but why couldn't we have finished this story first?